Rebellious 23rd-century girl Neo has big dreams of being a singing star, but her unusual fashion sense and personality keep her from making it big. When she finds herself transported to the 21st century, she finally gets her chance from a producer to sing with the guff Saya. If they put on a wonderful concert, they'll be the next big stars... but if they mess it up, they'll be nobodies forever! 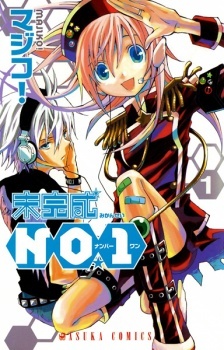 Mikansei No.1 was first published in English by Tokyopop on November 10, 2009 and April 13, 2010, respectively. The license was taken up again by VIZ Media, and published digitally under the VIZ Select imprint on December 23, 2014 and January 7, 2015, respectively.